Born of ideas to take your business places, more than a modern transport solution, the aerodynamic bodied Mahindra Genio with a wide and large corrugated cargo box and a carrying capacity in excess of 1,000 kg, was designed from the ground up on smart ideas, ideas that revolutionize cargo transportation. With a quality ride making work like play and play like work, the Mahindra Genio is aesthetically pleasing and impactful. 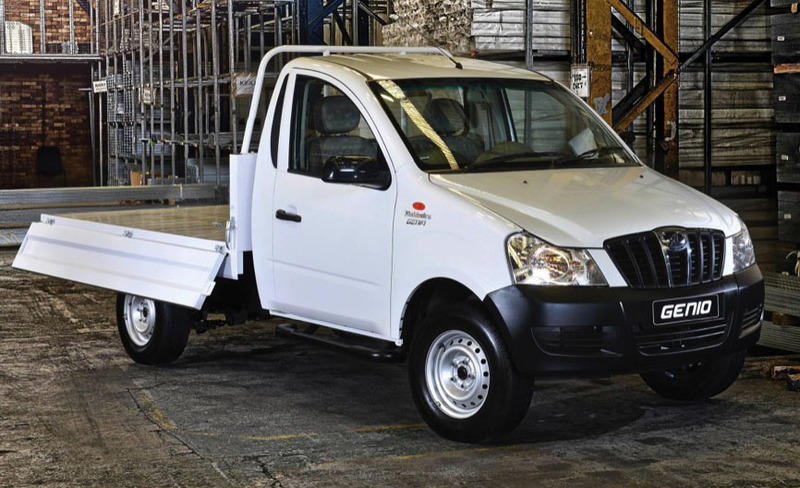 Available as a Double Cab as well as Single Cab variants which include the Long, Chassis Cab, Dropside and Maxivan. A plush interior designed for a premium feel for both driver and passengers alike. With a car like ride and interior you will surprised that it’s actually a bakkie. With Mahindra’s proven and reliable mHawk 2.2 litre 4 cylinder Common Rail Diesel Engine, you can move any load quickly, driving the rear wheels through a five speed gearbox. Giving you 89 kW of power and 290 Nm of torque, this engine is extremely low on maintenance thanks to its long engine life. Ad with fuel consumption of only 7.9 l/100km and a 74 litre fuel tank on the single cab variants, the Mahindra Genio really proves its mettle as a cost-effective load lugger. Speaking of load lugging: the Mahindra Genio has an overdrive 5th gear ratio of 0.79:1, which allows for reduced engine speeds. In combination with a 4.10 final drive ratio, you get a fuel-friendly vehicle with ample usable low-down torque, good acceleration through the gears and, through the use of advanced turbocharging technology, a more environmentally friendly bakkie with a cleaner burn. With added convenience such as an extra-large glove box for ample storage space, utlity floor console with bottle holder and mobile charging point, wallet and mobile case in the dashboard, extra-large sun visors and heated rear window, the Genio Single and Double Cab meets your every single need and maximizes your convenience.